For many years now, I have been playing squash all-year-round. I enjoy the game so much, I want to continue playing as much as I can, and quite honestly can’t see any reason for me to stop playing, or even reduce playing, at certain times of the year. For a while,I was puzzled as to why everyone didn’t continue playing squash all-year-round. However, when I started to do a little research, I found that there are some very good reasons why some players don’t continue playing squash all-year-round. Does squash have an official season? I can understand why sports like cricket and football have seasons, as they are outdoor sports and are governed by the weather to some extent. But why does squash have a season – and just so I know, is there an “official” squash season? Does it vary with location? When is it? Personally, I play all-year-round, and am just curious when I read about start-of-season or end-of-season squash events. Can someone enlighten me please? people would rather be outside doing summer activities is the likely answer. You can certainly play all year round and people do. My club is open year round. There’s just too much going on in summer to organize full leagues and tournaments. From a pro point of view, they simply have to have a time off from playing. Professional squash takes a huge toll on the body and like any other high-level sport it can’t be maintained all year round. As for amateurs, when the sun comes out and the weather is settled a lot of people don’t have the motivation to play indoors. A lot of guys I know play tennis all summer and don’t pick up a squash racket. US schools have three seasons for sports: fall, winter and spring. Squash is a winter sport. For this reason most of the key high school related matches (national championships, etc) occur during this season for the teams. On an individual basis players can play year round. But if competing on a team you need to follow the season. A good 40% of my squash club are tennis players in the summertime. I imagine that’s true for many as well. Squash/racquetball/badminton are winter sports, my clubs in all three sorta ebb and flow around the outside weather. My club has 2 ~18 week pennant comps per year (Spring & autumn) and a 5 week mixed comp in between pennants; so we’re only off season a few weeks out of the year. Then again it’s played on a wednesday or thursday night, so that might have something to do with it. 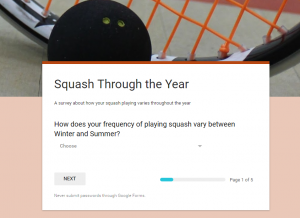 These answers started me thinking about the need (or otherwise) to have an official “Squash Season”. Many of the answers I received related to the weather, but obviously this can’t apply world-wide, since if there’s an ‘official season’ then this might be largely in the Winter months in the northern hemisphere, but would be largely in the Summer months in the southern hemisphere – provided the same ‘squash season’ was adhered to world-over. This entry was posted in Competitions, General, World Squash Tournaments and tagged playing squash all-year-round, squash season. Bookmark the permalink.